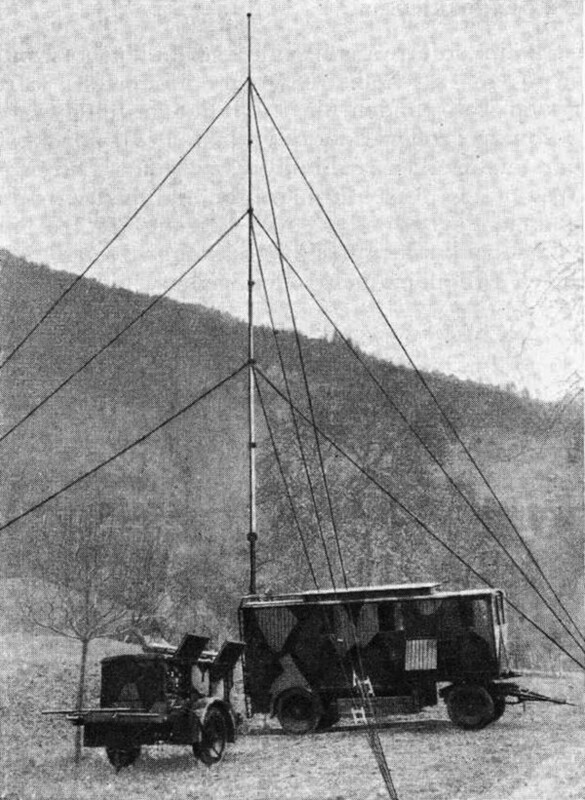 The Large Shortwave Station G1,5K or "B-Station", it got nicknamed "one-and-a-half-K" or "grandmother" by the signalmen, was the second high power shortwave station used by the Signal Corps of the Swiss Army. C.Lorenz AG at Terlin - Tempelhof has developed the 1,5 kW shortwave station with plate modulation in 1935, it has been built by the Swiss branch of Lorenz, the Standard Telephon & Radio AG at Zürich in the years 1937 - 1943. This station has been the backbone of the equipment used for command traffic of the Signal Troops and the Air Force Signal Command over many years. The Large Shortwave Station G1,5K has been developed by C. Lorenz AG, Berlin, in around 1933/34, it has been built by the Lorenz - branch Standard Telephon & Radio AG at Zürich in 1935/37. in total, 27 stations have been acquired (in the document "Wireless Stations of the Army, a number of 31 mobile stations and three stations for fixed use in fortresses is mentionned). It got the designation G1,5K (Gross / Large - 1,5 Kilowatts - K / Shortwave) with the Signal Troops and "B Station" with the Air Force Signal Command. In the standard configuration, the G1,5K is onstalled on a two axes trailer (so called "station trailer", 5800 kg), the generator on a single axes "machine trailer" (2200 kg). Three stations had been installed for fixed use in fortresses. The three stage Lorenz transmitter can be tuned in four ranges from 1090 - 6700 kHz, variometers are used for antenna tuning. In the transmitter the following valves are used: in the driver stage a RS337, in the intermediate stage two RS377, in the output stage two RS329g, in the modulation and keying stage two RS382 and three rectifiers RGN2504, in the microphone voice amplifier stage two RS282 and three RE084k. The transmitter covers the frequency ranges 1090-1930 / 1930-3430 / 3430-4830 and 4830 - 6700 kHz, dial accuracy of the analog dial is 1 %o, a luminous crystal is used for calibration at 3000 kHz. The transmitter output power ist 1500 Watts CW and 500 Watts in modulated telegraphy and telephony. The receiver used in the early years with the stations no. 1 - 14 was the two tuned circuit TRF All Wave Receiver EO509/I made by C.Lorenz AG. This battery valve receiver turned out to be unsensitive on shortwavex and made reception in Hell mode extremely difficult. So it was replaced by the All Wave Receiver "Uster" / E41 in stations with number 15 and above. In 1956, the station G1,5K was improved with the new receiver Autophon E-627 and the Telecrypto 53 / ETK combination for automatically encrypted teletype operation. The transmission quality often suffered from synchronisation errors which caused decryption faultsm this was not really improved after the receiver was replaced by the Siemens E-311 / E-645. Radioteletype operation with automatic encryption became much more reliable after the introduction of Krypto-Funkfernschreibers 58 with it's capability of automatic synchronisation. In the early years, not only telegraphy and AM telephony but also radioteletype Hell, in fact a radio-facsimily transmission mode, was intended to be used. The "Hell" printer developed by Siemens Hell-Schreiber prints out a text directly lisible on paper tape. As the shortwave communication quality strongly depends on propagation conditions, using the Hell mode was quite challenging for the signalmen operating the station. 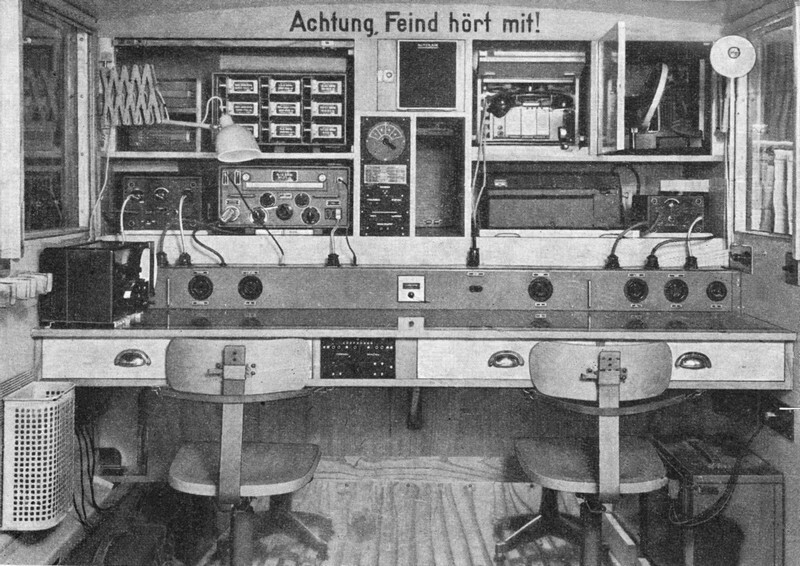 So even during World War II, the decision had been taken to abandon the Hell mode and to use high speed telegraphy instead: The station G1,5K saw the introduction auf automatic high speed telegraphy Moser-Baer, because of it had turned out that sending morse code by inexperienced signalmen (only few of them were trained wireless operators or at least radio amateurs, like most members of the Swiss Army, the soldiers had had a completely different everyday job and had only got a short basic education) was far too slow. By using automatic high speed telegraphy, transmission times were much shorter, but morse code training was necessary as well to read the morse code printed on paper strips with sufficient speed. A well trained signalman reading the Morse code by ear easily outperformed the automatic transmission. So this transmission mode was no success either - the station crew turned back to good old Morse transmissions using a Morse key and headphones, and much much morse code training. So the poor signalmen were only given holidays to see their familiy after they had reached a certain speed with Morse code. A major breakthrough with higher transmission speed was the introduction of the radioteletype system ETK developed by Dr. E. Gretener AG in the years 1955/56. With the ETK teleprinter and the Telecrypto 53 ciphering machine, even automatic encrypted radioteletype communication was possible. Because of propagation disturbance such as fading, the synchronisation between the ciphering machine at the transmitter and receiver side quite often failed and the message became illisible and had to be repeated. The first step to improve this was to use a high quality professional shortwave receiver, the Siemens E-311 (E-645) , which had a better performance in single sideband mode. The things really were made easy with the introduction of the KFF-58, the crypto radioteletype machine developed by Gretag with automatic synchronisation. With this machine, automatic encrypted communication was even possible with the very successful "lightweight" shortwave transceiver SE-222, which is capable of single sideband transmission. 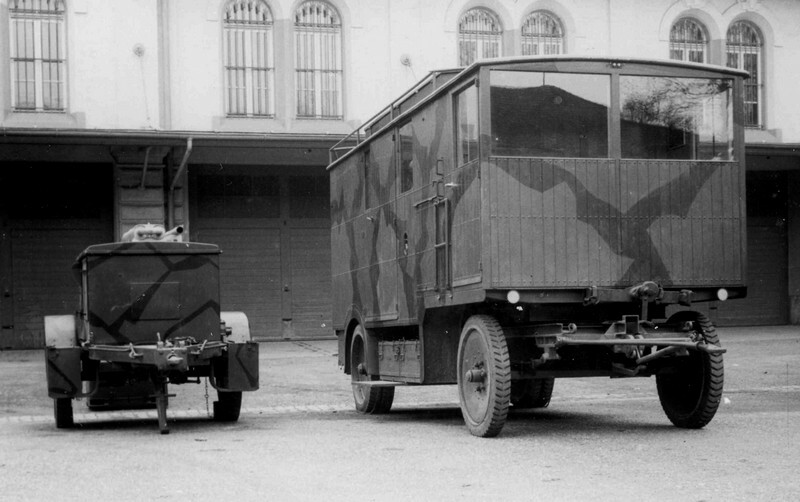 The station G1,5K is powered by a four stroke fuel motor operated generator providing 15 kVa three phase power, this was installed on the "machine trailer". The standard antenna of the G1,5K / SE-302 is a self-resonant 25 m telescopic mast on the roof of the station trailer. With an isolated base, the antenna can be installed up to five meters away from the transmitter trailer. A roof antenna or a long wire were used as reception antennas. The G1,5K / SE-302 has remained in service for centuries and has been faded out after a series of improvements not before the year 1970, it has been liquidated in 1975. 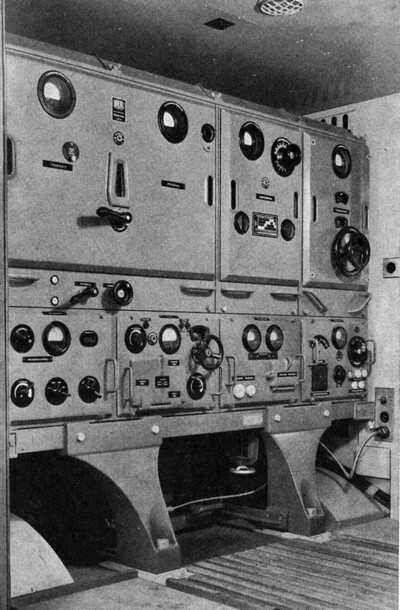 The "B station" of the Air Force Signal Command has been withdrawn in 1946 after all aircraft communication had been shifted into the VHF frequency range.